We went to Disneyland today. The kids had such a great time. We are so lucky to live close enough that we can be there within an hour. Having an annual pass is pretty nice. I didn't take pictures today, but here are some from a couple weeks ago. This one is where Anthony explains to me how he really feels about cotton candy. Amelia of course adores the cotton candy. She begs for it every time we go. Once in a while I actually say yes. 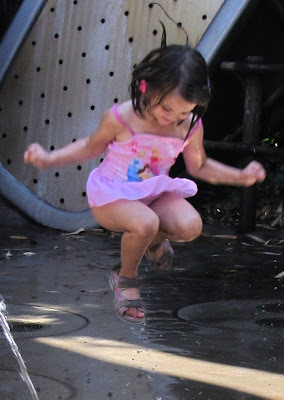 She also loves to go play in the Bug's Life water area. It's really cute, the area is set up like a yard would be if you were bug sized. There's a garden hose nozzle that has to be at least 12 feet tall. Amelia has a great time chasing the water drips. Unfortunately, she tends to chase the water away from me (no matter where I sit) so I get lots of shots of her backside. Anthony isn't as crazy about the water area, so he usually sits with me on the benches and watches the other kids play. This particular day he was so ready for a nap. I think this was actually Anthony saying cheese for me. Ha. He's a funny guy! I love this picture because all that's really in focus are her feet, which are at least a foot off the ground. The girl likes to jump. A. Lot. Hey, thank you for the tip for Fresh & Easy. Great idea! I am going to stop by there tomorrow to pick up some stuff! Holy crap, they both suddenly look so grown up!